1. He faked his death. This is the most obvious one. Although we saw Moriarty put a gun in his mouth and pull the trigger, there must have been some trickery along the way. We never actually saw much blood spatter or brain matter, which is weird for a death that involved blowing his brains out. We saw a small pool of blood around his head, but that’s pretty much it. So Moriarty could have used a fake gun. Put it in his mouth, pull the trigger so it makes a bang, and then fall onto a concealed blood bag. Not too complex. But there’s an issue with that. Would Sherlock really fall for it? Surely he would notice the abnormal blood spatter or the lack of brains? The only real way to explain this is that Sherlock was in on it, but finding a motive for that is difficult. So this theory needs a little more fleshing out to work. You could argue that the Moriarty we saw on the roof wasn’t the real Moriarty, and that we actually saw a clone or a look a like or something. But that’s ridiculous and wrong. The Moriarty on the roof acted and looked a lot like the real one. So let’s move on. This is an interesting one. Moriarty announced his big return by playing a prerecorded video with a voice modulator. It wasn’t live. There is every possibility that Moriarty is still dead, and someone else is pretending to be him. But who? Well, Mycroft. He said earlier in the episode that he didn’t want Sherlock to go away/die, and although he may try and hide it, he loves his brother. Perhaps, to stop him from going away, he staged Moriarty’s return. He is one of the few people that has access to every TV in the country, after all. If not Mycroft, perhaps some other, new character. The third Holmes brother that was mentioned in the episode, perhaps. Or perhaps Moriarty has siblings. It could be anyone. But this theory also has an issue. 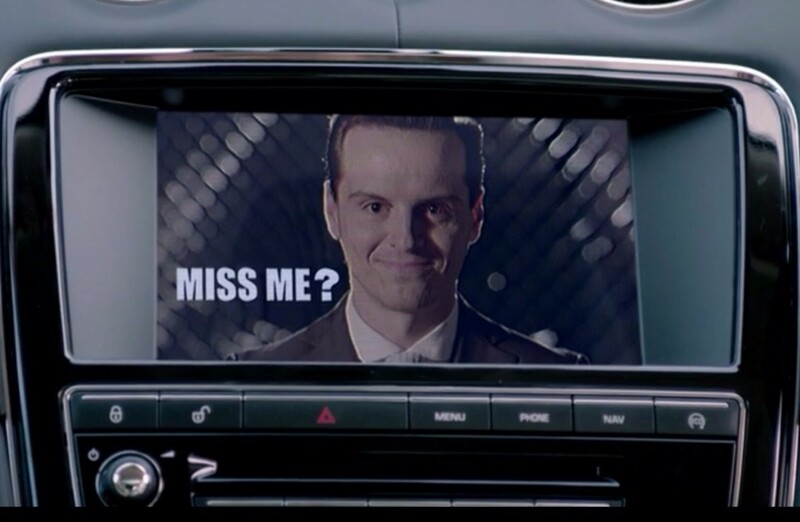 After the credits, Moriarty himself clearly turns to the camera and acknowledges the audience, saying “Miss Me?”. This seems to be an indication that Moriarty is actually back. So this theory might be wrong. 1. The dude who made Sherlock confirmed that Moriarty is dead, he said he can’t show the back of the head because its 9:30PM on BBC, something like gruesome rules that wasn’t suppose to be shown on that time. 2. Richard Brook is a real character, based on the novel, Moriarty had a twin brother but in this Series they’re not pulling the twin brother gag and it was confirmed from the start from one the creator Steven Moffat. 3. Moriarty is something you’d never expected in the next season. Some of its episodes states that Richard Brook is a character that Moriarty created, but the series is based on “Sir Arthur Conan Doyle’s Sherlock Holmes” which is the real Moriarty haven’t appeared yet on the screen. Andrew Scott isn’t the real Moriarty, Andrew Scott role was really Richard Brook and Richard Brook is a real character that made by Moriarty. Its really confusing, Moriarty is just telling Richard Brook to act as Moriarty, in that case on his death on the rooftop, HE WAS REALLY DEAD but the real MOrairty hasn’t appeared yet. I think a Moriarty clone works because they mention human cloning in the Hounds of Baskerville episode. Well, i think Moriarty is still alive. He was shot by distance. Every episode lies clues for next episode, so I think ‘the last vow’ gave us much data. Sherlock knew moriarty faked his death so he had to do the same. “You want me to shake hands with you in hell, i shall not disappoint you’. Then when sherlock found moriarty on his mind palace after marry shot him. He asked “you never felt pain, didnt you?” Suggests that moriarty experienced it already. As an ex military man, I can tell you without a shadow of a doubt, the if you shoot yourself in the head with a blank bullet, you will either die, or be seriously injured. That is a fact that anyone who knows anything about training with blank rounds will know. The other problem with the blank theory, it that people (perhaps ex soldiers) who have both fired live rounds, and trained with blanks, will tell you that you can immediately tell the difference between the sound a blank makes as compared to the sound a real round makes when fired.